Every major trip takes a fair bit of planning. Here’s some of what we did. And we should add that while we do recommend some companies we have not received any preferential treatment or payment etc. These are unsolicited comments. We have been thinking about this journey for many years, in fact we have wanted to “Live the Dream” after about two weeks home from our last adventure in 2004! So there it is, the mantra for this trip is “LIVING THE DREAM- 2 ON 2 WHEELS AROUND THE WORLD” Unbeknown to me – Shirley had arranged with our dear friend “VB” (Veronica Bryant) to have her dad David, a retired graphic designer, to produce the logo. It was duly presented to me at my retirement function. 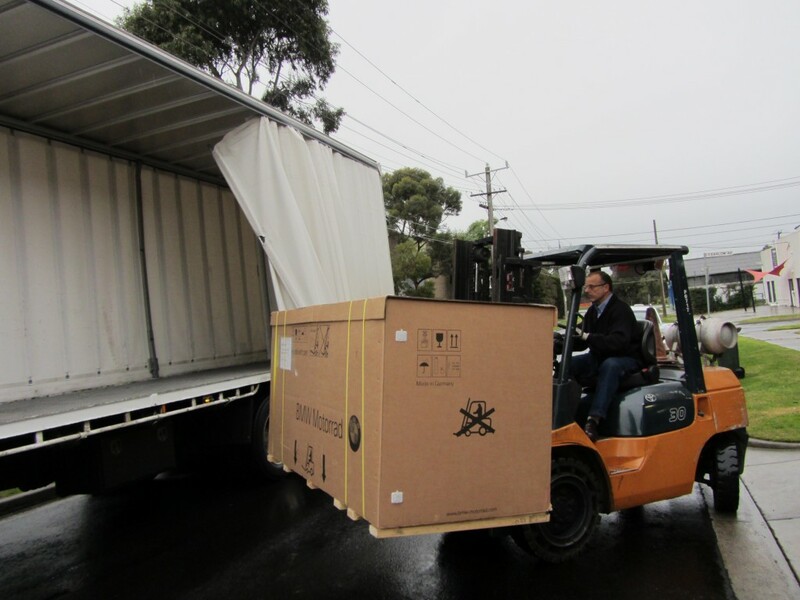 First things first, we needed a shipping agent to get our bike to South America. After some internet searching we settle on Blue Freight. We go for an initial interview with them and as luck would have it, Richard Dexter frequents one of our friend’s cafés in Wellington Street Collingwood. Blue Freight has agreements with companies in Santiago Chile, New York, London, Durban and Perth – perfect. They moved personal affects, furniture and a car for a former high ranking officer in Victoria Police from London. I contacted Sir Ken Jones who stated their service was excellent. We establish the time frames they need and what we are required to do. Last time we took our beloved BMW 1150GS. We modified it with better suspension and set it up to suit us. That bike met its demise on a bush track in Australia’s high country when I hit a four wheel drive coming the other way on a single vehicle track. The front end lodged itself in the bull bar and I suffered some rather delicate injuries as the nether regions ripped the tank bag off. That bike had done 150,000 kilometres. Unfortunately, it was a write off. I replaced it with a 2008 BMW1200GS Adventure. Shirley and I have ridden this bike since late 2008 and have again set it up to suit us. The seat has been re-shaped more for touring than off –road. The original seat slopes forward slightly and pushes the afore-mentioned nether regions into the tank – which I found uncomfortable towards the end of a long day in the saddle. We were recommended an upholsterer in Goulburn, about 800 kilometres from Melbourne. On a trip north, we visited his small shop and were impressed with the quality of workmanship. On returning home I promptly mailed the seats to him and they were returned two weeks later. For a very modest price compared to expensive replacement seats then end result is fantastic. I have no hesitation in recommending MJM motor trimmers in Goulburn if anyone in Australia wants a motorcycle seat made or modified. Their website might be basic but their products and service are first class. We both like sheepskin seat covers. Once I got the seats back, I had two sheepskin covers custom made by Black Sheep Australia in Maroondah Highway, Ringwood. Again I do some research. When I purchased this bike I didn’t want the Electronic Suspension Adjustment. I know it works well enough but I don’t want it falling apart or seizing in the middle of no-where. Changing the suspension is not as easy as on the 1150GS –particularly the front telelever. Last time I used Ohlins suspension with a stronger rated spring in the rear to take the weight of being two up and fully loaded. I looked at other brands but once again went with what I know is good and can be re-built. While they are not cheap, Ohlins shock absorbers have a great reputation and are infinitely adjustable. It may be overkill but in all sorts of riding, I find the Ohlins shockers second to none. Steve Cramer imports in Melbourne and is the guru on Ohlins and will fit different rated springs depending on your need. Last time, Steve stated the shockers would last 60,000 Kilometres before they would need re-building. He was spot on. I hope he is right again. Ohlins suspension front and rear with heavier rated spring on the rear shocker were duly fitted by my great mate and motorcycle mechanic Phil Marshall. Phil runs his one man operation called K and R motorcycles out of his factory in Mills Street Cheltenham. As the name suggest, he fettles BMW motorcycles exclusively. Ask anyone who rides BMWs in Melbourne and they’ll attest to Phil’s work and patience. He loves a challenge and I certainly dish up some beauties for him! A Garmin 550 Zumo GPS has been fitted to this bike. While it might not be the latest and greatest now, it is still serviceable for our requirements. Anyone who relies solely on GPS, in my opinion is very foolish. While they are great, particularly in cities, they do have limitations. We will take maps and I never travel without a basic compass – just a small one which is attached by a cord to the tank bag. My background, particularly with motorcycling has involved outback Australia where knowing how to find North and working out where you are could mean life or death. I won’t undertake a trip like this without the compass. To test out everything I rode around Australia on the 1200 I’ve nick named the ‘big red baron’. One of the most annoying things I found was the screen did not provide enough wind deflection to reduce wind noise. I was doing 1,000 plus kilometres days, day after day and for some reason the screen was just not right for me. I’ve replaced it with a slightly higher and wider one from Wunderlich. I haven’t had the opportunity to test it out on a long ride yet – we’ll see how it performs on the road. As with most old bikers, my right hand is starting to seize up and anything I can do to rest it is useful. I’ve fitted a Touratech throttle lock to ease pressure on my right hand on long rides. Standard GS Adventure aluminium luggage adorns this bike. It fits securely, is made for the bike and does not encourage overloading. Some aftermarket boxes are too deep. Which is okay on nice roads but off road or in deep sand it’s easy for ankles to get broken underneath them as you ‘paddle’ through heavy going. This time we are taking pannier bag liners to pack our clothes into. This will allow everything to be taken off the bike quickly and easily. I found the BMW original liners too bulky and consequently they take up a lot of room. I’ve opted for aftermarket nylon style bags purchased off the internet for both panniers and the top box. They are not strong but if treated properly, should be okay. I’ve added a Phil Marshall special – a luggage rack to take a soft bag mounted on the top box. This will take a soft bag with nothing more than light weight jumpers. A standard BMW tank Bag will do the job up front but I’ve also added some ‘Andy Strapz’ 10 litre soft side bags that mount either side of the tank. These will hold soft gear like a bike cover and wet weather gear. They will make the bike look even bigger but from experience, don’t interfere with the riding position or put too much bulk behind the rear axle. The only down side is they are not lockable – nothing of value will be kept on the bike so this should not be a problem. We will also carry one other soft bag and straps to allow Shirley to buy trinkets and bits and pieces. We found this a good idea last time. We will load up this extra bag until such time as we have enough to post home. This will be used on top or the off side pannier when needed. We are two up on the one bike and that makes carrying a tent, sleeping bags, mats and cooking gear difficult. Last time we stayed in cheaper B and Bs, hotels etc. and only got caught out once in Pakistan. We’ll do the same this time. We’ll carry space blankets just in case but I don’t want to overload the bike with gear we might use very occasionally. My mate Phil the mechanic had a Leo Vince muffler laying around his workshop. We replaced the original system with this and saved nearly 2 kilograms in weight. That has to be a good thing. The original tool kit is inadequate for this type of journey. BMW, in their wisdom have a plethora of Torx and Allen keys holding the 1200GS together. While I don’t doubt their engineering expertise, I do question the need to have a mixture of fasteners. I now have to take a fairly comprehensive toolkit, including special tools for the oil filter, to remove spark plugs etc. I purchased a Wunderlich tool roll with specific tools for the 1200GSA. I also have a tyre repair kit for tubeless motorcycle tyres and a mini compressor from Adventure designs. We had to replace the original accessory plug with a more sturdy one linked directly to the battery to run the compressor. The original plug has an over ride cut out, designed to protect the Canbus system. Spare spark plugs, an alternator belt and an oil filter will do. Anything else I’ll have to get on the road. Again, I don’t want to carry stuff I am not likely to use. As long as I can get the bike moving we should be alright. This bike does not use a traditional fuel filter, but some screening method built into the fuel pump. I hope the technology doesn’t let us down! We have modified the electrical system to enable up to four accessories to be wired via a fuse box. These will run the GPS, Intercom System. You have to be careful not to interfere with the Canbus system – we broke into the rear stop light wire to allow ‘switched power’ to the fuse box which is mounted under the original tool kit. I find the original lights on the GS to be inadequate. I don’t like being caught out at night and not being able to see. We have fitted xenon replacement lights and ditched the dinky little fog lights, replacing them with driving lights. Unfortunately I haven’t worked out how to wire them directly to the high/low beam to ensure they go off when you hit low beam. That infernal Canbus system doesn’t allow any margin for error and I am a bit coy to start messing with it. On the recent around Australia jaunt, these additional lights would have been really handy- kangaroos and big Brahman bulls don’t do much for the heart rate in the dark! We have been caught out at night in strange countries before and I see better lights as added safety measures for when you need them most. Our medical kit contains enough emergency gear – just in case. Basic bandages, antiseptic creams etc. are a must. We have malarial tablets and tablets to help prevent diarrhoea. Let’s hope we don’t need any of it. I know the Blue tooth is all the rage now days, but I prefer a wired system that does not need charging up. Shirl and I have used motorcycle intercom systems for at least 15 years. We are both comfortable with plug in hard wired systems. We have an Autocomm ‘Active-rider’ system. This has sturdy but flexible plug ins for rider and passenger. GPS and music systems play through it no problems. The only down side is the microphones are voice activated. I have found it handy to have the ability to turn off the microphones, particularly when the pillion starts complaining about riding too hard! If you undertake an adventure like this without first having yourself checked out and inoculated you are an idiot. Every precaution you can take before hand to ensure your own well being is money well spent. Our inoculations are all up to date and include Yellow Fever, Typhoid and Rabies. You must also prepare for the worst and hope for the best. We have medical evacuation insurance to give us and our family’s peace of mind. This is not cheap and only lasts 12 months. So be prepared to pay up. Think of it as a necessity then hope you never need it. We are told it takes 73 days to ship our motorcycle from Melbourne to Santiago. I spoke to South Bank BMW and Tony Sesto at BMW HQ in Springvale. They are only too happy to help out with an old crate. They just throw them out after receiving them from Germany. I go and pick out the best I can find from the pile at Southbank BMW. The crates are just a strong wooden platform with a wooden frame covered in cardboard. I have just finished the around Australia ride and have a problem with the rear differential seal leaking. Tony Sesto and BMW fixed this so hopefully I’ll have no more trouble with it. It’s a rush to get everything ready. Again with the help of my mate Phil “The mechanic” we spend two nights after hours in his workshop fitting the xenon lights and knocking down the bike so it will go in the crate. Just my girl Shirl, Phil and me. We laugh a lot, eat take away and finally have it all packed away nice and tight. Next we have to impose on one of Phil’s mates with a fork lift to get the bike onto the back of the truck. A delicate operation with the bike balanced precariously as it comes out of the workshop. It’s finally on it’s way. Shipping costs work out quite reasonable but we also take out freighting insurance – just in case the container falls off the ship! Now I’m stuck with riding my old 1966 Royal Enfield around for the next 73 days – or conning my mates to lend me a bike every now and then! Hey guys, awsome adventure. Wife and I are in the middle of planning a similar RTW gig. Just wondering if you can remember the cost of shipping to South America from Oz? We enjoyed reading the book about your last adventure and will catch up with your blog on this trip. Just wondering who you bought medi evacuation insurance through? We’re planning a similar trip next year….. Your preparation page is a ripper, met Phil the other day, really nice guy. The trouble with your travels from even following your last one has certainly created some insperation. I think Simone is starting to think this could be a good idea. I guarantee it won’t be on an LT.